Truly Mythic Tome. Card Artwork. Equipment Type. The handy grimoire to aid in your mystical spells. The Truly Mystical Tome is the perfect companion to your Mystical Spell, as it gives you the methods of implementing the spell, as well as give you a comprehensive list of all the spells available in said series. Enclosed in each tome is a story of a long lost realm (or realms, depending on Spell Blocks) and the nature of each spell and how it works based on the Orders of Magic. Available in wherever fine tomes and spells can be purchased. This one is another gag on the Magic Card game, as it is a mock up on the card booklets given in Fat Packs. 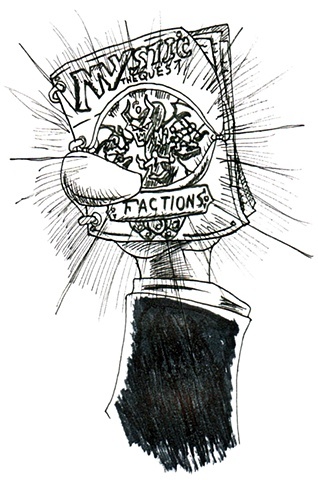 I originally felt a D&D manual would be more sufficient for this title, as it would play up on the D&D comedy tropes, but my co-creator already had it work in tandem with the Spell Card, so I had to settle for this design. To avoid litigation, I made toon-styled versions of Magic characters, while changing up the names, but keeping the familiar font and format of Magic :The Gathering.